Part of "Avernum: The Complete Saga". For the DRM-free version see the Updates and Support section of the website. For all versions saves are labelled Save0, Save1, etc. Game fails to load settings, tested on Windows 10 with Steam version. Attempts to read and write to garbage files in the installation folder. Open "Computer" in the Start menu, right-click on the CD and select Explore. Run the installer program (the application that has Install at the beginning of the name). Blades of Avernum might not run properly on newer Macintoshes and trying to run the game/installer will give an error. This problem is caused by the name of the program not ending in .app. To fix the problem, change the name of the program so it ends in .app. If you are trying to run an installer from a CD, copy it to your machine, change the name so that it ends in .app, and run it. In recent versions of OS X, game's graphics might occasionally freeze for a small number of users. The game is playing in the background and sound effects are still happening, but the graphics are no longer refreshed on the screen. When the screen freezes, type Shift-R. This should enable you to resume the game normally. Upgrade to the newest version of the game. You can ask for a copy of Avernum IV if you have bought the game to the developer. There is a rare problem in newer Windows machines where the game plays extremely slowly. This appears to be cause by an interaction between Avernum 4 and a driver or other piece of software we haven't identified. If you encounter this problem, reboot your machine and run Avernum 4 before running any other programs. If you have any music software running in the background, quit it before running the game. There is a good chance that this will help the problem. Also, some people have reported having the problem on systems with multiple monitors. Try deactivating the second monitor and see if the problem persists. If this solved the problem, please E-mail us and let us know. It will help greatly with finding a solution. In this folder, run "Audio MIDI Setup"
Under Audio Output, change the Format to 44100.0 Hz. 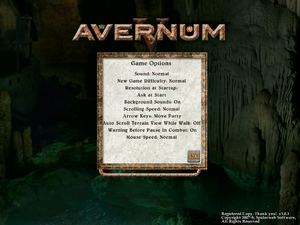 If you want to play the game with the same key, transfer the "avernum.dat" file (Windows) or "Avernum Prefs" (OS X) located in the Preferences folder (inside the Systems folder on your hard drive) to a safe place. ↑ 1.0 1.1 File/folder structure within this directory reflects the path(s) listed for Windows and/or Steam game data (use Wine regedit to access Windows registry paths). Games with Steam Cloud support may store data in ~/.steam/steam/userdata/<user-id>/206040/ in addition to or instead of this directory. The app ID (206040) may differ in some cases. Treat backslashes as forward slashes. See the glossary page for details. This page was last edited on 7 April 2019, at 06:49.